Each year, CMI founder Joe Pulizzi covers the essential roles you need on your content marketing team. It’s one of those posts that is consistently well received because it hits a nerve: Whom do you need on your team to make content marketing work in your organization? I had the pleasure of thinking through this question in more detail when Joe asked me to speak about creating the ultimate content marketing team at Content Marketing World 2017. While I shared a framework useful for restructuring your team and/or making hiring decisions (which will be published shortly on this blog), today we’re digging into the various skill areas your team needs to cover. While Joe typically offers a (helpful) laundry list of core competencies any content marketer needs, my list has a twist: The skills are broadly classified based on where you are within your company’s content marketing maturity. As our research reveals, about one-third of marketers are in the young and first steps category, another third are in the adolescent stage, and the last third characterize themselves as mature or sophisticated. As such, the roles are grouped into these three categories. By no means do you need to approach your hires in this order, but, generally, it makes sense to prioritize your hires based on what is needed first or most. Each skill area includes a high-level look at some of the responsibilities each requires. It’s not a comprehensive list, but it should give you a sense of what type of work is needed. You can refer to these responsibilities as you develop job descriptions. This list is not organized by job titles because, quite frankly, there is little standardization across the industry. I recall surveying 25 to 30 people in charge of content marketing programs, and every single person had a different title. While I don’t think titles should matter, I know they do, so possible job titles are offered to help you not only think about how to classify people on your team but also to help you mine job listings (think Monster, Indeed, LinkedIn) for ideas if you do need to hire. Gone are the days when companies are hiring someone who can do one job and one job only. In most organizations, hybrid professionals exist who have skills in multiple areas. The related skills for each primary skill area can help you think about individuals who can play multiple roles, but, again, there are no hard and fast rules. You’ll need to cover this first set of skills when you are starting out – or if you are struggling and not sure where to go. Every team needs to have someone who possesses these essential skills (as noted with the key icon). But you will not likely have one person per skill when getting started. Rather, you’ll have a leader or jack of all trades who will do many of these things. It’s imperative to start out with a solid strategy (and, no, a strategy is not your editorial calendar). Often, your strategy is created in conjunction with the leadership team, and it sets the stage for your entire program. How can you help your audience in a way no one else can? First comes strategy, then comes editorial planning. Your editorial plan is everything you need to do to bring your strategy to life. The topic of editorial planning is far bigger than one section of this article can encompass, but below are some of the key things it entails. What topics should we cover – and how should we cover them? What formats are best for our purposes? What is our internal process or workflow for creating this content? What are our standards for publication, such as writing guidelines and style guides? How will we determine what content we keep, update, or remove? When I chat with marketers about their teams, the biggest cry I hear is for someone to create the content: often writers, but also videographers, podcasters, etc. While hiring an exceptional content creator is absolutely vital, make sure you have your strategy and editorial plan in place first so the talent you hire can focus from the start on content that will further your mission. Never start your team with the content creators. Of course, not all writers (or any type of content creators) are created equal. Some writers excel at writing persuasive copy that can be used in emails and on your websites; some create masterful stories that dig into personalities; and others craft prescriptive, how-to content. Figure out what you need and find the person who best suits those needs. And, while I expect this opinion to be an unpopular one, in most cases it’s key to hire content creators who have a deep understanding of your industry. In this age of so much content, you need the best content on your topics, and people who are most experienced in your industry are more likely to get you there efficiently and effectively. Like writers, designers often excel in different areas. Some are fabulous with website design, others rock data visualizations, and others have a penchant for e-books (just to name a few). Many companies have designers in-house, but if you are just getting started, you may be tempted to crowdsource your design. You can learn more about the pros and cons of that approach from JK himself. Another essential hire is a proofreader. In fact, this is the person I would hire after you have your lead person who often focuses on strategy, editorial planning, and content creation. I learned from (painful and embarrassing) experience that you simply can’t do your own writing and editing (well, you can’t do it well). Always have that second set of eyes to check for grammatical errors. As your practice grows, you may not only need a proofreader but also an editor (or editors), too. While most editors have a solid understanding of grammar and spelling (myself notwithstanding), editors are also able to review a piece and tell you whether the story is being told in a clear and compelling way or if the piece makes sense as part of the greater whole. As with writers, it often makes sense to hire editors who have experience with your industry (it does not matter as much with proofreaders unless your industry is especially technical or specific). Again, you want your content to be best-in-class, so it’s helpful to have someone who can ask the tough questions and be knowledgeable about industry trends so you know you’re presenting the best possible solutions. The next three skills, which I group as skills growing companies should master, focus on how to get the word out about your content: social media, SEO, and email. Before I go into detail, let me address something I know you’re thinking: Shouldn’t new and young companies have these skills on their teams too? Absolutely. However, as I prioritized what skills are needed first and reflected on my experiences with building companies, I realized many companies start with someone who has a basic knowledge of each of these skills, but as the companies grow, they need in-depth knowledge in each of these areas. You may have heard that content marketing is like a 401(k) plan: You make steady investments over time and that investment grows substantially over time, often with minor tweaking from you. Some teams have SEO experts on staff, while others bring in a consultant as needed. Mike Murray has served as our SEO expert for years, and he offers guidance on everything from SEO opportunities and the changing Google algorithms, to the impact of mobile, and more. Social media is often relegated to a junior person on the team, but this often is a big mistake – and a missed opportunity. The person who handles your social media is the face of your brand, and you must be able to implicitly trust that person (or people) to handle everything from friendly, everyday interactions to delicate situations with ease and grace. Lastly, this is a person who understands the implications of social media and how they interact with everything else you do. For instance, this person should understand how social media and SEO play together. The third way to distribute your content is through email. But, of course, you’re not only sharing your content, you’re also building an audience who wants to hear from you – and that’s often best accomplished through email. Consider this last set of skills when you have the basics covered and you want your program to become more sophisticated and mature. Of course, if you have people on your team who have these skills, bring them in earlier in the process. These skills are not listed in any order, but as you read through them, chances are you’ll see where you have opportunities to grow your team – and scale your efforts. We marketers are practically drowning in content, and librarians are experts at making content organized and findable. Digital librarians can help solve issues surrounding all that content you have (images, blog posts, web pages, etc). For instance, they can help you avoid ROT – redundant, outdated, and trivial content. While you could retain all your content, it’s a terrible practice. It overwhelms your team and leads to a poor experience for your audience members because they will likely stumble on content that isn’t putting your best foot forward. They’ll bounce from your site with the perception that your company isn’t relevant. Not only do digital librarians put practices in place so you can decide what to keep and what to get rid of, but they also help organize everything so it can be easily found. They are skilled at creating taxonomies, metadata, and tagging systems. Can you imagine how much time that would save – and what a better, consistent experience it would offer – if everyone on your team was working from the same version of your best content? It’s easy to see how a digital librarian can be of service in any growing company. One of the things Joe stressed in his CMWorld keynote presentation is that content marketing success is contingent upon creating an audience who wants to hear from you – and 92% of the most successful content marketers focus on building an audience (Source: 2018 B2B content marketing research). While this is a huge priority, how many marketers have someone on their team dedicated to learning about and building their audience? As your organization grows, take a cue from magazines and other media companies who are focused on subscribers (not leads) – have a person focused on truly understanding, growing, and delivering ongoing value to your most precious asset: your audience. Your content is only as effective as the experience it provides to your ideal audience. If your audience can’t easily find what it is looking for or the experience on your website is less than desirable, it’s almost a certainty that your content won’t be as effective. In most organizations, it’s not feasible to have a dedicated person on your content marketing team who is focused on UX and web development. However, it’s ideal if you can have at least one partner in your IT / web department so you can work to make your website as easy to navigate (and convert) as possible. While much of the content marketing space is saturated, a huge opportunity, especially for B2B content marketers, exists: providing original research to your audience. 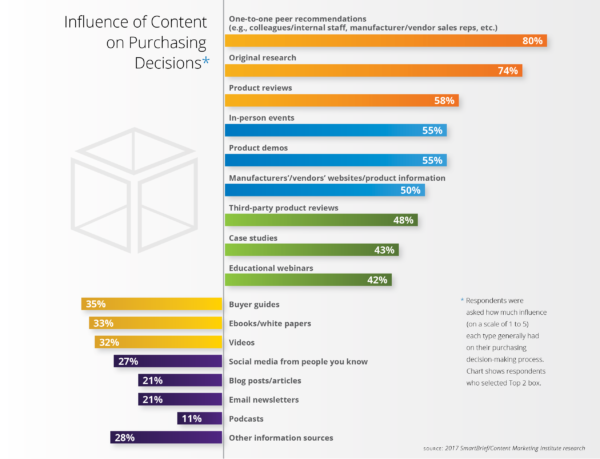 This summer, we conducted research with SmartBrief to learn how content influences the B2B buying process. One of the findings that resonated with me the most is that 74% of B2B buyers indicated they find original research to be influential in the buying process. B2B buyers are asking for original research from brands! However, as our latest content marketing research shows, only 37% of B2B marketers are using original research as one of their content marketing tactics. Speaking from CMI experience, I have seen how original research on industry trends can fundamentally shape a business – and build an audience. We started our content marketing research in partnership with MarketingProfs in 2010, and the annual reports have become the most widely cited research in this space. To this day, we see at least one new mention of our research every single day. In short, if you want your business to grow, consider how you can incorporate original research into your strategy. Lisa Murton Beets, our research director, has been so instrumental in the growth of our editorial – and business. You can also steal the plan from Amanda Subler, who focuses on CMI’s media relations and generates interest for each report before it is released. Far and away, the most mentioned aspirational skill in our #CMWorld chat about teams was data analysis. Everyone wants to better understand what content is working and how they can create more of it. Or how they can optimize existing content to do more for their brands. If you don’t have a good handle on your data, partner with someone within your organization or find help. People who are data-savvy can help not only uncover the data you need, but, more importantly, communicate the opportunities you have based on your data. The last – but certainly not least important – skill area is technology. This may be the biggest understatement in this article, but technology to support marketing has exploded in the past several years. To get an idea of scope, consider Scott Brinker’s Marketing Technology Landscape Supergraphic. The latest version, published in May 2017, includes a staggering 5,381 solutions. That’s up 40% from last year’s 3,500 technologies and an explosion since 150 were listed in 2011. It goes without saying that content marketing is evolving – as are the requirements for all of the businesses employing this discipline. The skills above are those I believe will set teams up for success, but I would love to hear your ideas: What skills are most critical? What is missing? It’s also important to note that skills are only one element to consider when putting together your content marketing team. 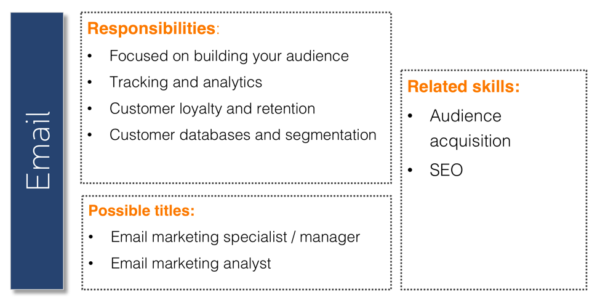 Read the second part of this post to learn about the content marketing framework for teams. 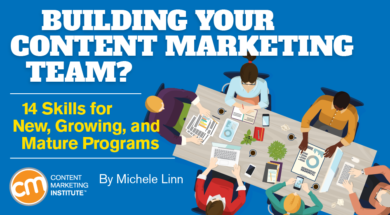 Ready for the framework to creating a great content marketing team? Don’t miss Michele Linn’s post on the subject. Subscribe today for the daily email and be one of the first to read it.